Notes: Oldham Werneth was the original terminus of the Manchester & Leeds Railway’s (M&LR) Oldham Branch which opened on 31st March 1842. The branch connected Oldham to the M&LRs Manchester to Leeds main line at Middleton. The Manchester to Leeds line had opened throughout on 1st March 1841. The station was to the west of Oldham’s town centre which, by the 1840s, had already become an important textile manufacturing centre. Werneth did not remain a terminus station for very long as the M&LR obtained an Act to extend the line a mile further into the town on 30th June 1845. A contract was let to George Thompson in October 1845, and work began straight away. On 8th July 1847 the M&LR changed its name to the Lancashire and Yorkshire Railway (LYR). The extension opened to a new terminus at Oldham Mumps on 1st November 1847, and from that date Oldham Werneth became a through station on a double- track line. 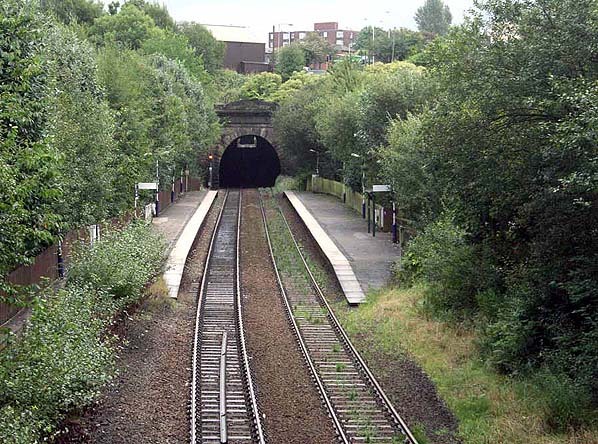 The extension had to pass through two tunnels, the first of which was immediately east of Werneth Station. below but was supported between the two tracks by columns. Werneth had two platforms that stretched west from the station building. Steps led down to each platform. The station was also provided with an overall roof. 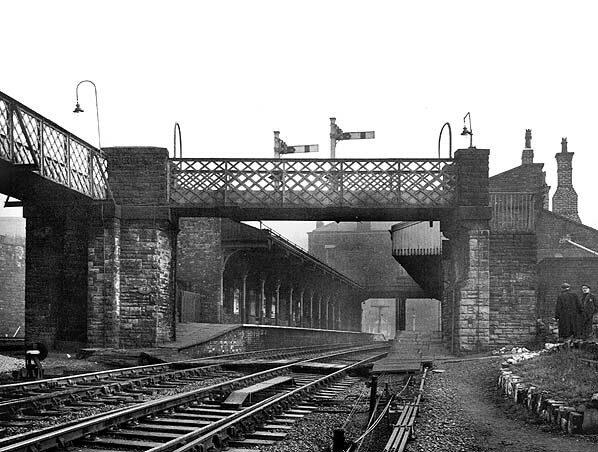 An iron footbridge crossed the line at the west end of the station and served as an alternative access to passengers, as it had a link into Featherstall Road which crossed the line to the west of the station by an over-bridge. Extensive goods facilities were developed on both sides of the station, with sidings, stables and coal offices to the north, and two goods sheds and a 10-ton crane to the south. The yard to the south was in a very confined space, and one of the goods sheds could be reached only by using turntables. By 1850 ten trains per day in each direction served Werneth. The services connected Oldham to Manchester Victoria, but many trains going in the Manchester direction terminated at Middleton where passengers could catch onward connections to Manchester. On 12th August 1863 a further extension of the Middleton to Oldham line opened to goods services. This six-mile extension was to Rochdale, which was on the same Manchester and Leeds line as Middleton, and it effectively created a loop from Middleton to Rochdale via Oldham. On 2nd November passenger services were introduced on the new line to Rochdale. By this time Oldham Werneth was served by twenty- four trains in each direction running between Rochdale and Manchester Victoria. Again, some of the services started or finished at Middleton. Werneth was also served by one train per day in each direction between Manchester London Road and Oldham Glodwick Road, operated by the Manchester, Sheffield & Lincolnshire Railway (MSLR). With the opening of the new line a route had been created from Thorpes Bridge to Rochdale, via Werneth that eventually became known as the ‘Oldham Loop Line’. Trains serving Werneth continued to run between Manchester Victoria and Rochdale, but most of them now travelled via the newly-opened line. There were fifteen in each direction. A few services continued to run via the Middleton route. lines was just to the west of the station a signal box was provided on the south side of the line just beyond the up (to Manchester) platform. On 1st January 1922 the station became part of the London & North Western Railway (LNWR) when that company took over the LYR. However on 1st January 1923 the LNWR was in turn absorbed by the London Midland and Scottish Railway (LMS). By 1938 Werneth was still being served by fifteen local trains. On Friday evenings a train to Glasgow and Edinburgh via Rochdale called at the station. On Sundays-only a train that originated at Royton and ran on to Blackpool Central via Manchester Victoria served Werneth, as did another that started at Milnrow and ran to Southport via Manchester Victoria. In June 1958 British Railways introduced Diesel Multiple Units (DMUs) onto the Oldham Loop. A Cravens-built type of DMU (later known as class 104) which had twin power cars used the line as they were easily able to cope with the steep gradients. 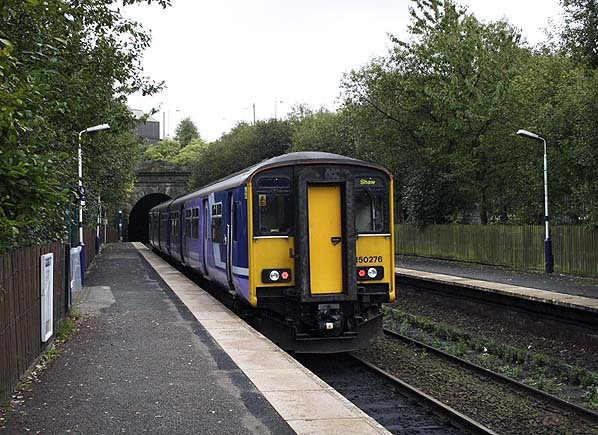 The service pattern at Oldham Werneth was a train every twenty minutes to Manchester, via the Thorpes Bridge line, and northbound trains every twenty minutes. The northbound service destinations alternated with a service to Rochdale (every 40 minutes) and a service to Royton (every 40 minutes). Two Saturdays-excepted trains continued to call on their way to Rochdale from Middleton Junction, but there was no service in the other direction. In total there were twenty-nine trains between Manchester and Rochdale and twenty five between Manchester and Royton: this was Werneth’s highest-ever frequency of service. Werneth about every 45 minutes in each direction. Trains between Royton and Manchester Victoria were reduced to seven on weekdays in each direction, eight on Saturdays, and there were none on Sundays. No trains operated from Middleton Junction. In 1966 further changes took place, including the closure of the Royton Branc on 18th April (as recommended by Beeching) but also Oldham Central station (which Beeching implied was to be retained) on the same day; Werneth goods yard on 10th October. The service pattern was altered so that most trains serving Oldham Werneth ran between Manchester Victoria and Oldham Mumps, with fewer continuing onward to Rochdale. By 1968 the Werneth service had settled into a thirty minute frequency in each direction. Alternate northbound trains continued beyond Oldham Mumps to Rochdale giving only an hourly frequency to that town (although services were also provided to and from Manchester Victoria via Castleton). In the 1970s Oldham Werneth station lost all of its buildings which were replaced with simple ‘bus shelters’ on the platforms. The footbridge was also removed and replaced with ramps that led up to Featherstall Road from each platform. It is assumed the station became unstaffed at the same time. It escaped the attention of the Beeching Report. However the British Railways Network for Development map of March 1967, published when Stanley Raymond was Chairman of the British Railways Board and Barbara Castle the Secretary of State for Transport, showed that Oldham Mumps to Rochdale would not form part of the ‘basic railway network’. Subsequently a footnote in the May 1972 passenger timetable advised that the Secretary of State had given consent to the withdrawal of passenger services between Oldham Mumps and Rochdale. However, by this date, the South East Lancashire North East Cheshire (SELNEC) Passenger Transport Executive (Greater Manchester Passenger Transport Executive – GMPTE - from April 1974) had stepped in and agreed to fund the continuation of the service. From May 1995 Werneth was served by half-hourly Manchester Victoria - Shaw & Crompton trains in each direction; Rochdale trains continued to run at a half-hour frequency, but they passed through without stopping. This was the last alteration to Werneth’s train services. the required works. To enable these works to go ahead the Oldham Loop had to close. Werneth, along with all other stations on the line, closed on Saturday 3rd October 2009. A number of special services, including steam-hauled trains, ran on the last day to celebrate the line and its history. Many local people turned out to watch the last trains run. The final train to depart from Werneth was the 23:25 Manchester Victoria to Rochdale service. Wernerth station will not be a part of the final Metrolink scheme at Oldham as trams will run through the streets of the town. As funding for the street scetion of the tramway was not confirmed until 2010 it will not be ready in time for the completion of the rest of the route. As a temporary messure so as not to delay the opening the route of the railway from Wernerth station to Oldham Mumps will be used on a temporary basis from Autumn 2011 through to 2014. Trams however will not stop at the site of Wernerth station. In late August 2010 the platforms and the track at Wernerth were still in place. Sources: The Oldham Loop – Part One – Manchester Victoria to Shaw & Crompton, Jeffery Wells, Foxline Publishing ISBN 1870119681 and The Lancashire & Yorkshire Railway Volume 2, John Marshall, David & Charles. ISBN 0715349066. Encyclopedia of British Railway Companies, Christopher Awdrey. Guild 1990. Regional History of the Railways of Great Britain Vol10 The North West, G.O. Holt, David & Charles 1986 ISBN 0946537348. The Lancashire & Yorkshire Railway – Volume 2 J. Marshall, David & Charles 1970. ISBN 0715349066. An Illustrated History of Oldham's Railways J. Jooper, Irwell Press 2006 ISBN 1871608198. Railways Across the Pennines Jenkins and Quayle, LBS 1990 ISBN 0711018405 Additional source Alan Young. Dean Lane, Failsworth, Hollinwood, Oldham Central, Oldham Mumps, Derker, Royton Junction, Shaw & Crompton, New Hey & Milnrow. 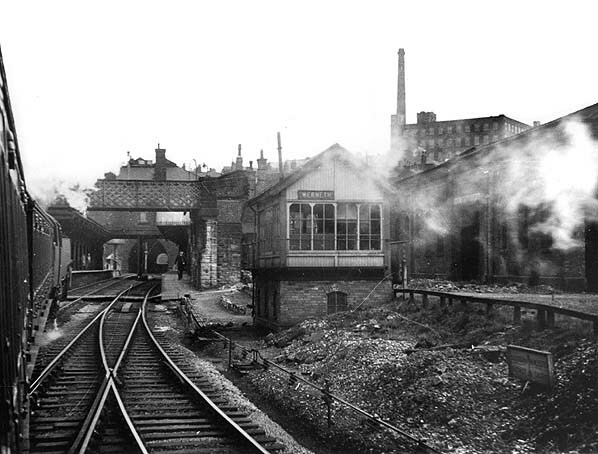 Looking east to Oldham Werneth Station in November 1956. The footbridge which was located at the west end of the station and gave an alternative access from Featherstall Road South can be seen in the foreground with the station lying beyond. The points that form the junction between the Thorpes Bridge line and the Middleton line are just visible on the left. In April 1957 a local Oldham Loop service heads east into Oldham Werneth station. The train is crossing the junction between the Middleton and Thorpes Bridge lines. This service had taken the 1880 Thorpes Bridge route which by this date all but a very few passenger services used. 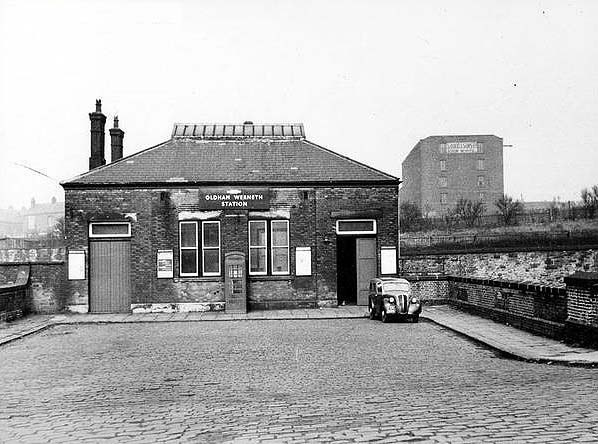 Werneth signalbox can be seen on the right of the picture and beyond it the station itself. One of two goods sheds is seen on the right. Looking north at the main entrance to Oldham Werneth Station in 1970. The station was reached via a stone sett driveway. Looking east from a passing train at the up platform in July 1985. Looking east at Oldham Werneth station from Featherstall Road South bridge in September 2009. 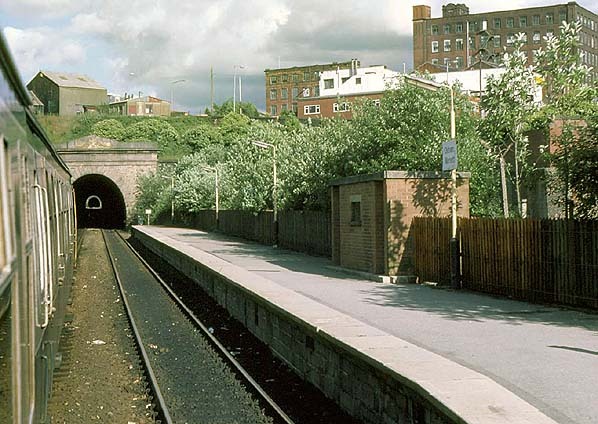 At the far end of the station is the Werneth tunnel. By this date the station had only basic facilities. The trees hide the goods yard which was located on both side of the station; it closed in 1966. A Shaw train waits at Oldham Werneth station in September 2009. Looking east at Oldham Werneth station in August 2010. The platforms were still extant at this date. A fence had been erected across the tunnel mouth to prevent unauthorised access. 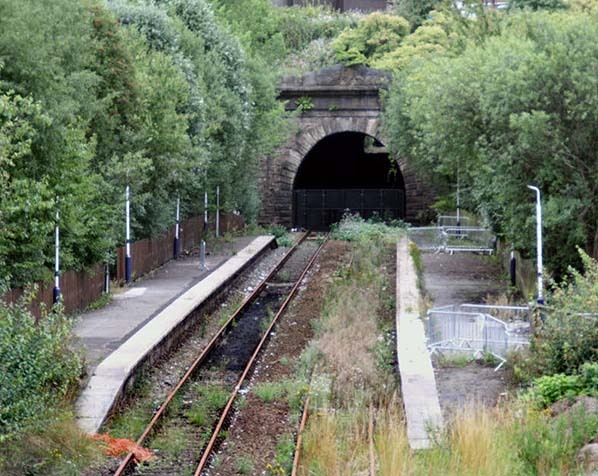 Metrolink trams were originally going to use the tunnel for a few years while a section of steel track is built through the centre of Oldham this plan has now been dropped and the tunnel and station site will not be reopened.